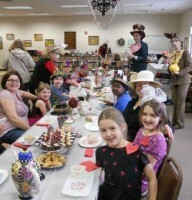 The Mad Hatter hosted a grand tea party at the Annandale Public Library on Saturday, Jan. 23 to celebrate Alice’s 150th birthday. The White Rabbit, March Hare, Door Mouse and children ages 6-12 were invited to attend the party in Alice’s honor. Everyone came in either their favorite costume or tea attire. After a short performance, children created their own “mad hat” before enjoying tea and treats. The Red Queen led the group in a rousing game of The Queen Says before sending everyone home with a bag of treats. Since the program was not filled, some parents stayed to celebrate the day. The Hatter will be hosting another party at the Kimball Public Library on Saturday, Jan. 30 at 10:00 a.m. Attendees must RSVP by registering for the party online at the library events page or calling the Kimball library during open hours at 320.398.3915.